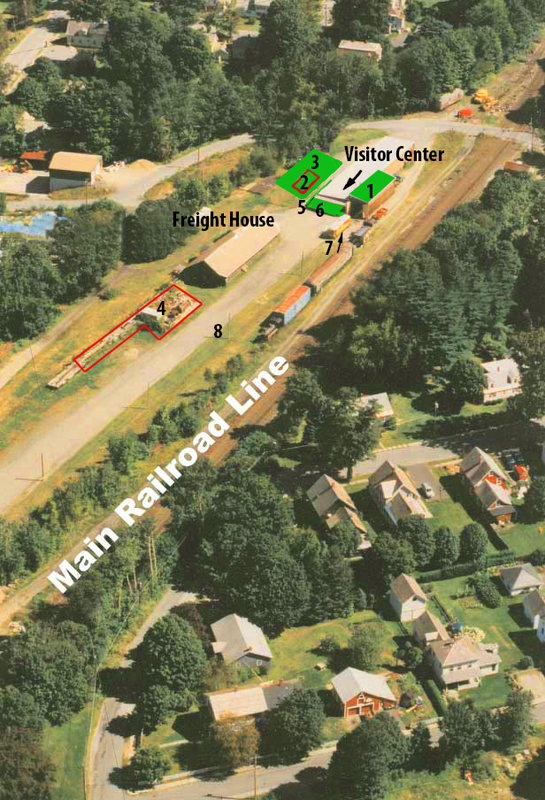 This shows the Buckland Freight Yard as it was about 2000. Park near the Visitors Center in the building marked Trolley Museum, buy your All-Day-Passes inside, and board No. 10 for a ride into history. Below: An older (before the overhead wire was installed or the carbarn was built), wider view, showing a little of the village of Shelburne Falls. The red line shows our trolley route, from the Visitors Center to Salmon Falls Artisans Showroom, and back. You may board at either end of the line. The Bridge of Flowers, McCuskers Market and other Buckland shops are just beyond the lower left corner of this picture. Check out the Buildings Page for more information on the buildings.